INDEPENDENT SOLUTION for Porsche cars 1997-2005 with PAS ALARM unit that uses ID13 or ID48 in key. Using specific softwares 54 or 165 you can solve LOST KEY or make SPARE KEY very fast,no need car in your workshop,only PAS ALARM unit. SOLUTION for Toyota,Lexus,Peugeot and Citroen cars,that use 4C,4D-60,4D-67,4D-68 and 4D-70 chips. 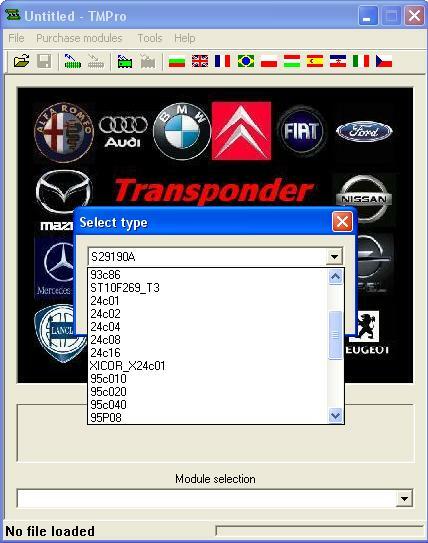 Using specific softwares 52, 83, 87, 92 and 153, you can program transponder ready to start car. 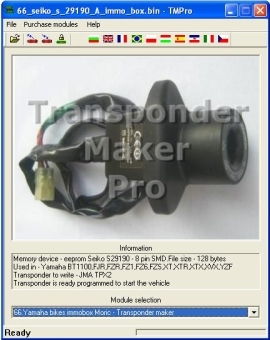 INDEPENDENT solution for Fiat/Lancia/Peugeot/Alfa Romeo/Citroen CODE2 cars. 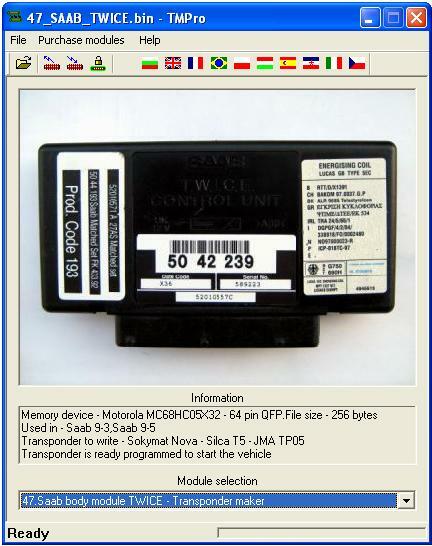 This means all vehicles 1999 up to date, which use precoded by chassis number keys with Megamos Crypto transponder (ID48). NO MORE need to order keys from dealer and to wait for them. Using Fiat CODE2 modules (6, 7, 8, 9, 45, 48, 59, 100, 112, 118, 175) software prepares chip and shows PIN code - all you have to do is to program key into car. INDEPENDENT solution for Alfa Romeo 156/166 cars, which uses PCF7935 transponders (ID44). Using Alfa 156/166 module (5) software prepares PCF7935 transponder. You DO NOT need any futher operations - just fit chip into key and start vehicle. If old keys are erased, software shows PIN code and prepares transponder, ready to be matched with vehicle using diagnostic device. INDEPENDENT solution for Renault/Opel Vivaro/Dacia Logan UCH cars. This means all vehicles which uses keys and 12 - digit PIN code. NO MORE need of expencive remotes. 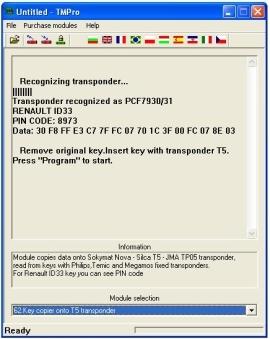 Using Renault UCH modules (30, 31, 44, 57) software prepares PCF7936 chip and shows PIN code - all you have to do is to program key into car. Also if you KNOW 12 - digit PIN code, you DO NOT need to read eeprom from UCH module. You can make DIRECT chip preparing using corresponding module and PIN code. 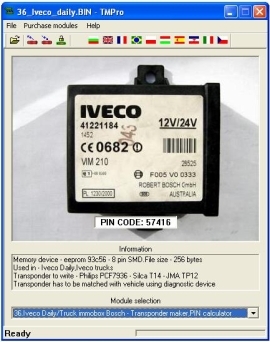 INDEPENDENT solution for Iveco Daily and Iveco Trucks,which uses keys with ID46 transponders. NO MORE " Sorry, we can`t supply your PIN code, you have to buy new full set". NO MORE need of expencive Iveco keys. 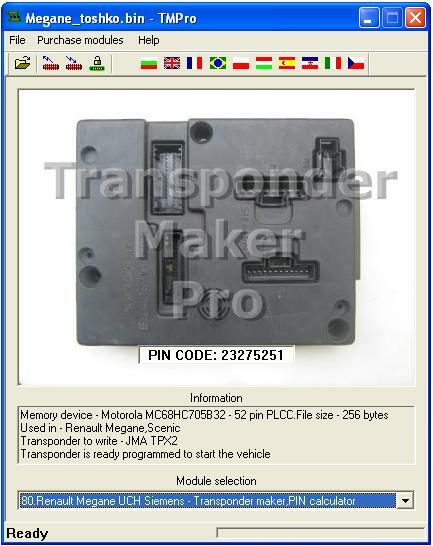 Using Iveco module (36) software converts PCF7936 chip into ready to be programmed into any Iveco van or truck. If you KNOW pin code, you DO NOT need to open and read immobox, just prepare chip and program it into vehicle. In case you don`t know it, read immobox eeprom and software will calculate and show it. INDEPENDENT solution for Ford and Mazda vehicles, which use OUTCODE-INCODE system (so called CODED ACCESS). 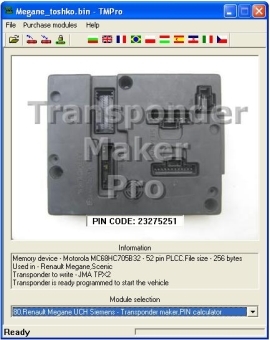 NO MORE need expencive testers and stable Internet connection while doing key programming.Using Ford and Mazda modules (69, 70, 72, 73, 74, 81, 82, 84, 89, 106) software programs JMA TPX2 - Errebi TX2 chip ready to start vehicle. SOLUTION for Yamaha, Suzuki, Kawasaki, Ducati, Honda, Aprilia, BMW, KTM, Peugeot,MV Agusta and Piaggio bikes. NO MORE need to search for bike ECUs, which do not have immobiliser function and to rearrange bike wiring. Using modules 25, 33, 58, 66, 67, 68, 90, 96, 97, 98, 101, 108, 109, 128, 129, 131, 168, 171, 177, 178) software prepares chip, ready programmed to start bike. 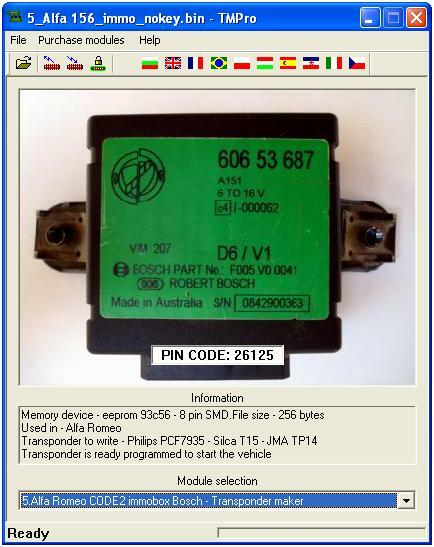 For Yamaha bikes there is solution for both variants - with eeprom 66 and with Moric MCU 108. 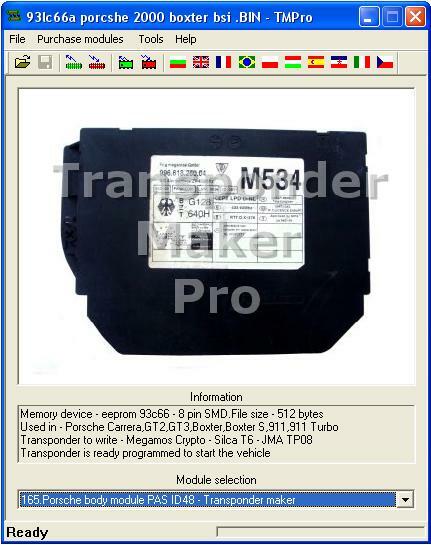 KEY COPIER modules ( 62, 63, 64, 65, 145) help you to copy all of Philips/Megamos/Temic fixed keys (ID11,ID12,ID13,SAAB,ID33) and also Philips ID41, ID42, ID44 VAG, ID45, ID46 and Texas 4C and 4D crypto keys. 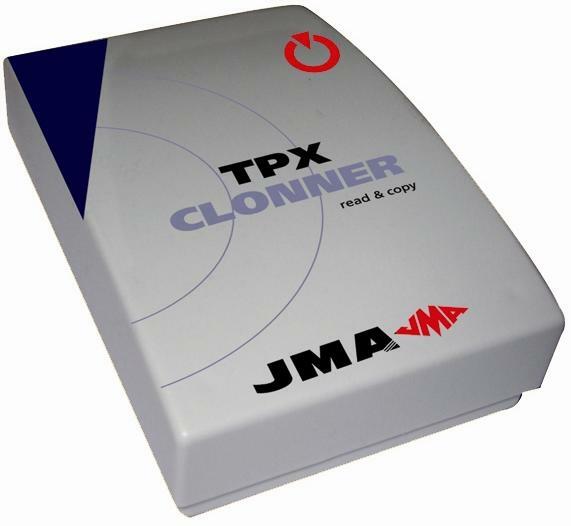 NO NEED ANY SPECIAL PRECODED CHIPS, simply T5,PCF7935,JMA TPX1, JMA TPX2 and JMA TPX3/4.JMA TPX1 and JMA TPX3 you can reprogram many times, JMA TPX2 once locked cannot be reprogrammed.In addition you can see vehicle PIN code for Renault ID33 keys (module 62), Renault Megane/Scenic ID4D keys (module 65) and for Peugeot 206/406 ID45 keys (module 63). IMPORTANT NOTE: Module 65 requires JMA TPX cloner for to work. IMPORTANT NOTE: For cloning Toyota,Lexus,Yamaha bikes,Suzuki bikes,Kawasaki bikes,MV Agusta bikes,Daihatsu and Perodua JMA TPX CLONER IS NOT NEEDED. 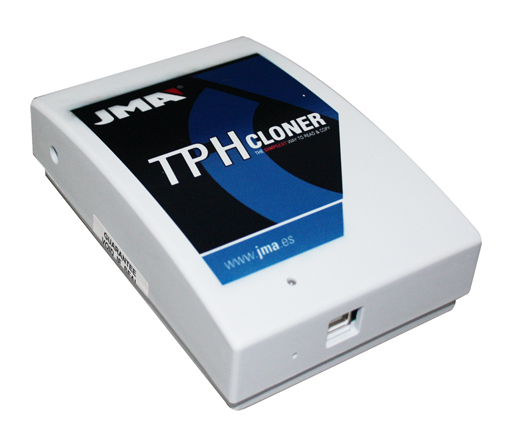 IMPORTANT NOTE: Module 145 requires JMA TPH cloner for to work. 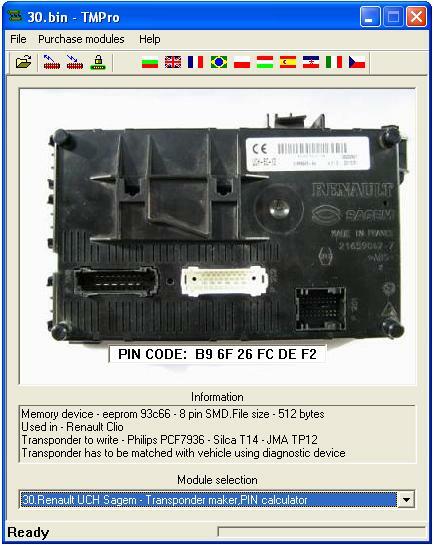 SOLUTION for Renault Megane/Scenic vehicles, which use Texas crypto 4D chip in key. Using modules 79 and 80 you can program JMA TPX2 - Errebi TX2 chip and car starts. In addition software shows 8-digit PIN code in case you need to erase old keys from vehicle with diagnostic device. 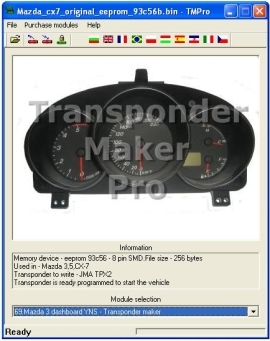 SOLUTION for Scania, Volvo, Mercedes, DAF, MAN and Renault trucks. NO NEED to wait for dealer to come, moreover some of dealers need truck to be towed to them. Using modules 34, 37, 51, 53, 88 and 93 software prepares chip, ready programmed to start truck. SOLUTION for SAAB 9-3 and 9-5 vehicles 1998-2009. When all the keys are lost, the only solution is to buy new very expencive TWICE unit from dealer. NO MORE - using module 47 and 111 software prepares chip or remote, ready programmed to start vehicle. 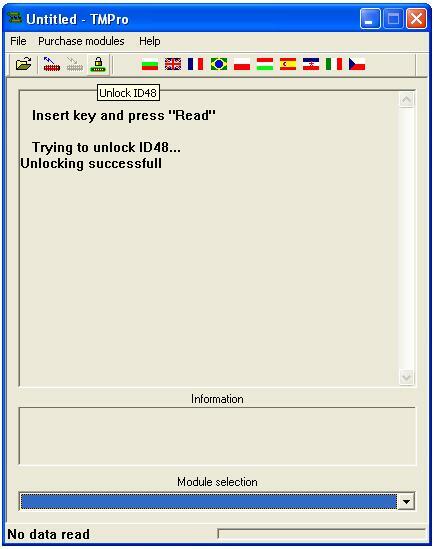 UNLOCKER of locked ID48 chips.After programming on vehicle, most of ID48 keys become locked and cannot be used again on other vehicle. Now with TMPro you can unlock them. NOTE: not all ID48 chips can be unlocked, try and if you have a luck you will get unlocked chip. The ID48 unlocker is free function. IDENTIFIES AND SHOWS data for all transponders on market - ID11, ID12, ID13, SAAB, ID33, ID40, ID41, ID42, ID44, ID45, ID46, ID48, ID4C, ID4D, ID73, ID8C, ID8E. 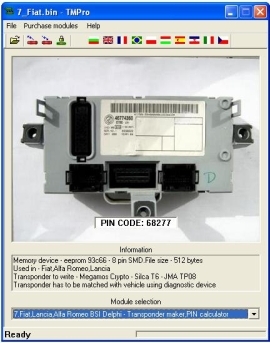 For Philips it shows to which car manifacturer it belongs - VAG,Opel,Peugeot/Citroen, Renault (shows 4-digit PIN code), Mazda, Alfa Romeo, Honda, Volvo/Mitsubishi, Nissan etc. 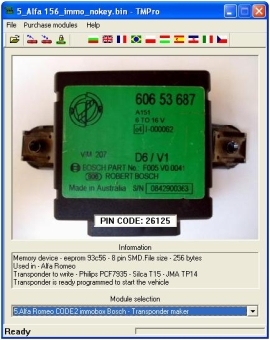 For Opel ID40 it shows if chip is not locked or already programmed to car (locked). 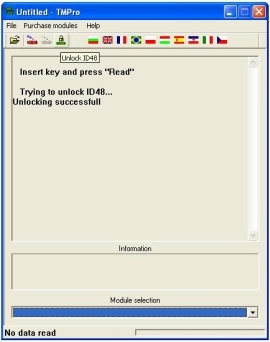 For ID48 shows if is locked or not, there is possibility for unlocking. For ID4D shows content of all pages and also if particular page is locked or not. For BMW ID73 key and HITAG2 CAS keys reads mileage, stored in key. For BMW HITAG2 CAS keys you can change mileage, stored in key. 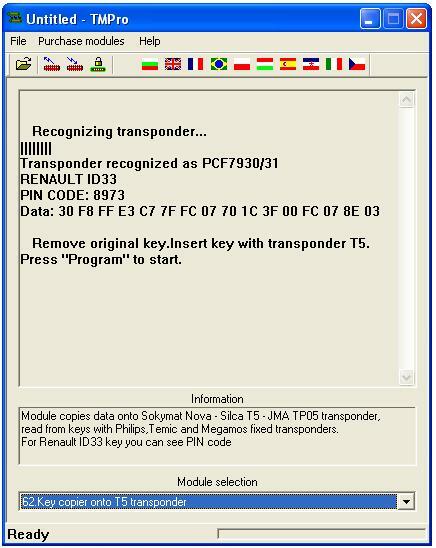 For Renault keys and cards based on PCF7947 you can read mileage and VIN,stored in key. EXTERNAL INTERFACE gives to you ability to read/write many of memory devices,that are used with software modules - all of serial eeproms 24cXX, 25cXX, 93cXX, S29190, X5328, also ST72334, ST10F269, Motorola 912/9S12.Reading of Motorola 912/9S12 is possible with quartz 4 MHz,8 MHz or 16 MHz.If quartz is of other value,you must change it with 4,8,or 16 Mhz. For reading/writing of 93cXX eeproms process is fully automated - NO NEED TO THINK which settings are correct - x8 or x16. Software automatically recognises correct settings and use them to read or to write eeprom. To read - connect to memory device, press "Select and read memory device" button, select desired memory device and OK and reading is done. After end of reading, if content matches to any of specific softwares,screen will change to corresponding software and you can program key. If you wish to save file with memory content, you can use SAVE FILE button right next to OPEN FILE button. Same way you can write memory devices - load file in soft using OPEN FILE button, press "Select and write memory device" button, select memory device and OK and writing is done. Writing process for all devices is with immediate verifying - soft reads byte and compare with value just written. This way if writing procedure goes to end, eeprom is 100% written correctly. External interface cable has 8 wires - red, blue, white, green, orange, brown, gray and yellow. Connection diagrams for different devices you can find in HELP menu of TMPro software. Reading in-circuit is possible,but not in all cases. For ensuring of correct communication, TMPro test all of pins of eeprom or MCU before beginning of reading or writing.In case something is not OK and you get LIFT PIN... message, short quartz of the immo box MCU and try read again.If after shorting quartz pins LIFT PIN... message appears again, you have either to lift from board pin(s), that are connected to corresponding wires,or to desolder eeprom and read on-board using TMPro eeprom adapter At reading of MCU`s like ST72334 (module 128) or ST10F269 (module 131) it is also possible to get LIFT PIN message, but in this case it is not possible to short quartz, only way is to lift pin(s) or cut tracks. LIFT PIN message shows colour of wire, connected to pin that must be lifted. Example: Lift pin - green : means to lift from board pin, to which is connected green wire. READY to START CAR transponders in 80% of software modules. Avoid needs of PIN codes and key programming procedures. TMPro saves your time. If you have coleague, which main job is to remove and refit locks and immoboxes, with TMPro you will not need to go to car to do key programming.This is applied for modules, which prepare ready to start car transponders. You can check this in information box below immobox picture. Just read immobox dump and using TMPro write transponder. This also means, that you do not need PIN codes anymore for these immoboxes. Your coleague refit immobox and lock and car is ready to start. You DO NOT need to go to car to match key anymore. TMPro lowers your costs for original keys or remotes. 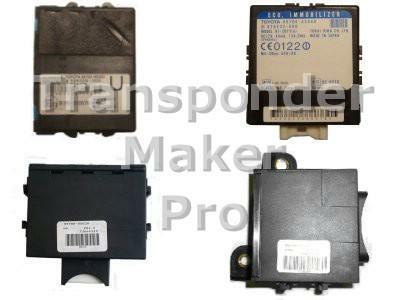 Some cars like Renault,Fiat and Iveco accept for programming only expencive specific remotes and keys. NO MORE - now with one click on PROG button you can convert common transponder into ready to be matched with car. TMPro reduces time for finishing locksmith job. BMW,Fiat,Alfa Romeo and Lancia cars uses only preprogrammed by chassis number keys and you have to offer from dealer and wait for them. NO MORE - now using eeprom dump, readed from memory device and one click on PROG button you can program into transponder specific information anf it become ready to start or to be matched with particular car. Also you get PIN code, needed for key matching procedure. TMPro gives more independence in locksmith`s job. 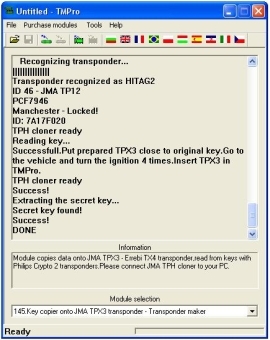 Vehicles, which uses transponders in keys can be divided into 2 groups. First is which not use PIN code. Second is which use PIN code. For second group you have to order PIN code by chassis number, to pay and to wait for it. Sometimes supplied PIN code is not correct. Also for some vehicles you have to order precoded by chassis number keys. 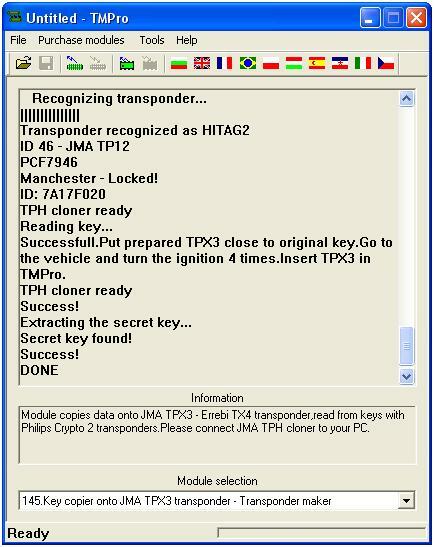 All this steps can be bypassed, if your immobiliser is supported by TMPro. For 80% of modules TMPro prepares from immobox eeprom dump ready to start car transponder and you do not need any futher operations. Just cut newkey, put written transponder in it and start car. 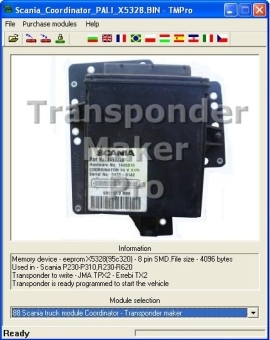 For the rest 20% of modules software shows immobiliser PIN code and you have to match written transponder with car. You can use key programming devices such as AD100, DEC Superscan or similar.